Geneva — Today (14/12), the International Organization for Migration (IOM) is releasing A Framework for Assisted Voluntary Return and Reintegration (AVRR) to guide policymakers and practitioners’ work in this important field. AVRR programmes help migrants who are unwilling or unable to stay in their host countries return to their countries of origin. IOM started implementing AVRR programmes in 1979 and has since then provided return and reintegration support to over 1.6 million people. Throughout the years, AVRR concepts and practices have undergone major changes. AVRR programmes have progressively expanded beyond Europe (where they have long been in place) to become embedded in national policies across Africa, Asia and the Pacific, and the Western Balkans. The number of stakeholders involved in the organization of voluntary returns has grown, as has the interest among development players in supporting sustainable reintegration. Dangerous migration routes continue to place migrants in vulnerable situations, therefore strengthened protection standards are necessary in the context of return and reintegration. 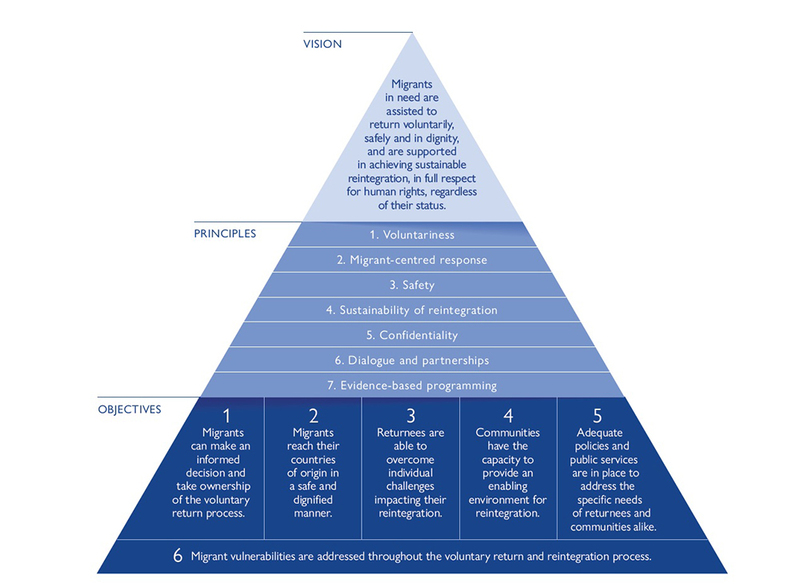 In recognizing this evolution, and based on IOM’s longstanding experience, the framework was designed to reaffirm the key tenets of assisted voluntary return and reintegration in an increasingly interconnected and interdependent world; to guide decision-makers and practitioners in the design and implementation of AVRR-related policies and programmes; and to propose a roadmap to address voluntary return and reintegration holistically, based on complementary efforts between migration management and development actors at the international, national and local levels. A Framework for Assisted Voluntary Return and Reintegration marks an important milestone for the Organization and its partners with regards to AVRR engagement. The framework is available in full here. A Framework for Assisted Voluntary Return and Reintegration.